Griffin: [to Carly] So, I hear your place has air conditioning. Carly Shay: Yeah, half the building's in there. I guess that's why you're here, for cool air? Griffin: But not for me. I brought my Pee-Wee Babies. Carly Shay: Oh, my God. Griffin: Look, they're really valuable, and if they get too hot or too cold, I mean, they could become misshapen. Griffin: Yeah, so, can I keep 'em here until we get the power back? 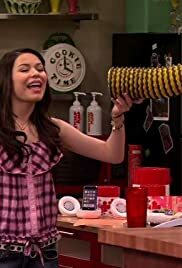 Carly Shay: Okay, tell you what.